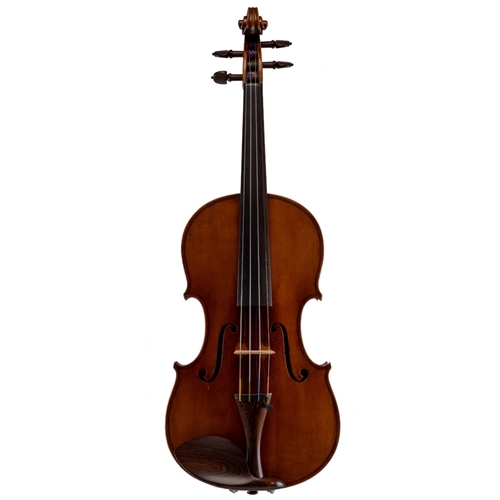 This is a very nice old violin with lovely bold features. The corners are very crisp and strikingly pointed, the peg box is carved with a very pronounced curve, and the stunning book matched maple back has a wide flame which meets at the seam with a strong upwards chevron. The varnish is an orange-brown on an amber ground, with some wear around the bridge feet. The tone of this unique instrument is full and clear, and it can produce a lot of volume. If you're looking to be heard, this may be the instrument for you.